Demonic horror gets channeled into the HTC Vive at QuakeCon 2016. QuakeCon 2016 hosted Bethesda VR, an exclusive area of the exhibitor hall dedicated solely for testing virtual reality versions of Fallout 4 and DOOM on the HTC Vive. The most prestigious competitor to the Oculus Rift, the HTC Vive uses two remotes complete with triggers and a trackpad similar to those found on the Steam Controller. In most cases, players can travel around inside the game by throwing portals with the left remote, however the Vive’s satellite sensors allow players to move around within a controlled area of roughly 12 feet. I had the pleasure of experiencing both the HTC Vive and the DOOM VR demo for the first time at QuakeCon 2016 this morning. Though the HTC Vive and its competitors have an intimidating bulk to their appearance, the headset itself is rather light and well-supported by the lateral and vertical head-straps. Those with glasses need worry no more, as the VR goggles are wide enough to support even the most ornate of frames. Unlike the Oculus, the VR display is fully immersive, taking up the entirety of the player’s field of vision. Due to the current movement restrictions of VR devices, most games and demos are build around the previously mentioned teleportation mechanic, and DOOM VR is no exception. The demo began with a brief overview of Doom Guy and featured demons, presented as character models on a series of tables, of which I could rotate and examine with great detail. Once I selected a playable character- in this particular run, Doom Guy- I was sent into the first area of the DOOM VR demo, a UAC corridor with infinitely spawning enemies. I could switch between guns using the trackpad on the right remote, while movement and grenades were assigned to my left hand. 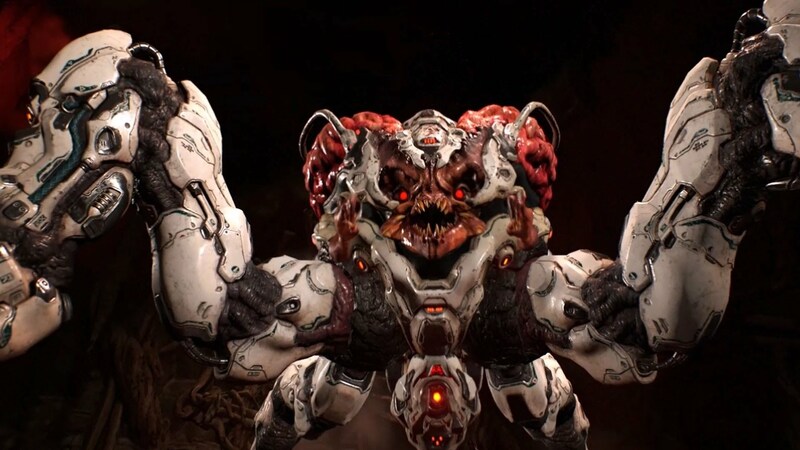 Having been assaulted by an army of demons from all sides, the VR DOOM experience is absolute chaos, but it never truly overwhelms the player, thanks to brief moments of forced slow-motion allowing players to regain their footing. There were no Glory Kill animations, however demons still explode with the same satisfaction found in the full version of the game. The demo whisked me away into an arena in Hell. While the previous UAC corridor gave me an idea of environmental depth, the conveyance of scale was truly shown in the Hell arena, with stalagmites towering over me and demons launching fireballs from overhead. Hell introduced the ability to traverse between tiers, as long as I could see the platforms above and below. Even with the spastic teleporting between different heights, not once did I feel a sense of motion-sickness, possibly because I myself was stationary outside of the game, apart from me flailing around like an action hero. The climactic finale of DOOM VR, I was sent into one final chamber surrounded by the “big bads” of the demon hierarchy, only watch them fall at the hands of the full game’s final boss, the Spider Mastermind. What followed was a wild, frantic battle against an enemy that showcased the true potential for enemy scale in VR; most of the fight was spent with me looking up as the Masterminds gigantic legs took giant strides over my head. As delightful as my time with the HTC Vive was, there’s two glaring issues with the setup- space and the afterthought price tag; apart from the $800 list price, the owner needs roughly 12 square feet of unobstructed space for the motion trackers, meaning a living room is the most ideal place for usage. Steam Machines and small form PC’s are on the rise, however VR requires a significant amount of hardware performance, as the game is rendered twice simultaneously for each eye. PC gamers with older rigs could expect to spend upwards of $1,100 between the HTC Vive and potential CPU and GPU upgrades. DOOM VR proves that virtual reality will be the next viable gaming platform, albeit an exclusive one for several years. DOOM is available for PC, Xbox One and PS4. The multiplayer mode received the new “Unto the Evil” DLC pack over the weekend, containing new armor, taunts, three new maps and an additional demon transformation.